There's nothing worse than being stuck on the manufacturing line for huge stretches of time. If your shoes cause leg pain, it's the worst job in the world. Long hours of repetitive work are hard on anyone, but when you're forced to stand next to the most boring p ... (see full details) (see specifications) #FLSFS2416. There's nothing worse than being stuck on the manufacturing line for huge stretches of time. If your shoes cause leg pain, it's the worst job in the world. Long hours of repetitive work are hard on anyone, but when you're forced to stand next to the most boring person on the planet, it's even worse. Where did the boss find that guy? We can't do anything about the guy on the line, but we might solve your foot and leg pain. Order up a pair of Florsheim FS2416 Men's Composite Toe Black Leather Oxford Work Shoes. In them, you'll experience less foot pain and leg fatigue than in cheap department store shoes. The Florsheim FS2416 features a black leather upper attached to a direct-inject, TPU outsole--both materials make this a great, all-purpose work shoe. Leather is naturally breathable, flexible and water resistant. TPU offers excellent abrasion resistance, is highly tensile (meaning it takes a lot of force to tear it) and remains flexible over a wide range of temperatures. In addition, TPU resists solvents, thus the soles are chemical and oil resistant. Overall, this means that soles made of TPU are long wearing, resist the degrading properties of heat, oil, chemicals and solvents, and are slip resistant. You'll be sure-footed in a pair of Florsheim FS2416s. These casual oxford shoes have 100% non-metallic construction, and they still protect your feet. Composite toes are the non-metallic answer to steel toe protection. They're made of lightweight materials like Kevlar or plastic and meet ASTM standards. They're also Electrical Hazard Rated. Static dissipative (SD) footwear protects you from electrical hazards on the job. SD footwear has minimal electrical resistance. It won't promote the build up of static electricity, so sensitive machines are safer. Even if your shift has you working extremely long hours in these shoes, the XTR extra-large toe cap keeps your toes from feeling constricted and sore. They have a super-soft Polyurethane midsole and a removable Polyurethane cushioned insert to ensure that your feet stay comfortable. The Dri-Lex lining is designed to move perspiration away from your feet, keeping them dryer and healthier than many other types of shoes. The next time your neighbor on the line wants to talk about his model airplanes, just wiggle your toes (you can do that now) and think about how comfy your Florsheim FS2416 Men's Composite Toe Black Leather Oxford Work Shoes are. Don't listen to him--just smile and nod. love this shoe! I have purchased this pair about 5 times over the last few years . It is my everyday 14 hour a day shoe. Very nice shoe and I would buy it again, it's that comfortable. 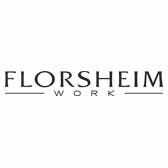 I am impressed with the large selection of Florsheim shoes offered on this web site. I choose this pair for the color and shock absorbing sole. The reason I purchased it is as an engineer I need to walk the shop floor, but also need shoes that look nice with slacks. I do not want to swap shoes at work, so this would be my normal work shoes. So I purchased 11EEE and it is just normal width but had to return it because the width is just regular. I instead got a Rockport 11W which is the correct width. Florsheim are you listening! please fix the width of your shoes. Florsheim Shoes: Men's Composite Toe Oxford Work Shoes FS2416 is being added to your cart.